In 2 Timothy 2:2, the apostle Paul, in his final communication before his execution, implored Timothy to be involved in the training of the future generations of missionaries. In a clear injunction, he invokes four generations of service; himself, Timothy, the students Timothy will train, and then the future students of those new missionaries. There can be little doubt that Paul felt the training of the future generations of missionaries was a significant element of missionary service, for him, and for every future missionary as well. Only missionaries can train future missionaries! Only those who have been there can know the challenges the next generation will face. Perhaps no other profession, except medicine, so requires the experience of previous practitioners for the successful training of the future generations. Teaching potential new missionaries is an essential part of the ministry of every long term missionary. It is not an option; it is a God-given requirement! In fulfillment of that injunction, I accept the responsibility to teach missions/intercultural studies here at Kentucky Christian University. This is my fourth semester on campus in my forty year missionary ministry. In conjunction with the university, plans are to increase that tempo significantly in the future, as an average of once every ten years would simply be meaningless at my age and stage in life. I must pass on what I have experienced and what I have learned while I am still able to do so. After teaching here only two years ago I am back. I plan on returning, as long as the Kentucky Christian University will have me, every other year in the fall. This is my second stint here on that new schedule. It will be sufficient to insure that anyone interested in missionary ministry can receive adequate training here during their four year college career. It also allows me to remain as an active missionary in Colombia during that process. At the present time, I am two thirds of the way through the fall semester. I currently have twenty two students in my two classes. That means I have about 5% of the student body of around 500 in those two classes. For an elective class in an eclectic topic, that is an excellent ratio! I am privileged that so many chose to take my classes and give me that privilege of training them to do what I find so rewarding; the preaching of the Gospel in the regions beyond! Teaching is a tiring addition to my already busy schedule. When in the states, I need to be traveling and speaking on weekends. Supporting churches deserve to be kept up to date on what we are doing together in the preaching of the Gospel. But such travel is enjoyable but tiring, where I put in two or three long each week. 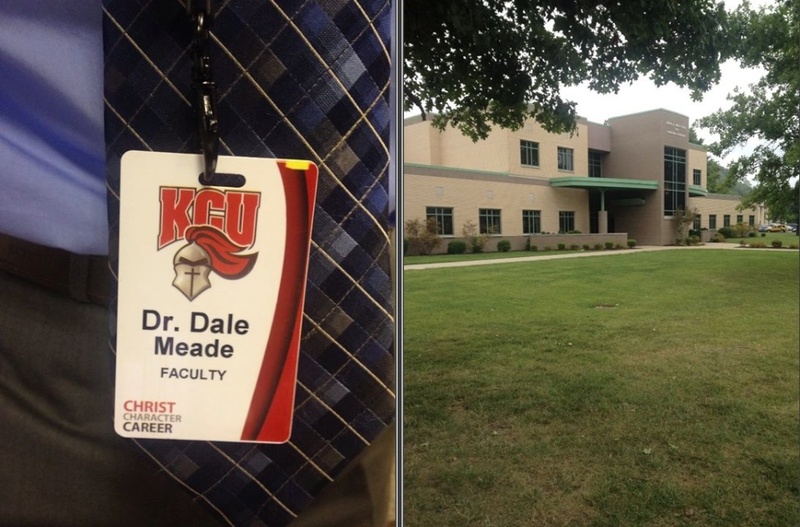 When those travels are over, I head to KCU, where I teach nearly a full time class load here. I will arrive back here on Sunday night or Monday as early as possible. I then begin work preparing the final form and format for my classes which I teach on Tuesdays and Thursdays. I have already developed the scope and sequence for my clases and have the syllabi in order. But I must add the details that I will include in my lectures. Along with that I have my attendance records to keep and papers and tests to write, give, grade, and then record. There are mundane chores, such as cooking, washing, and cleaning in my apartment here as well that keep my busy during the week. Then on Thursday afternoon, immediately after class, I jump in my car and head home so I can spend some time with Jeanie before taking off for my speaking date. That makes for a hectic fall and I am often exhausted as time rolls by. Yet at the same time it is a rewarding experience and a great opportunity to fulfill the calling that our Lord has given to those of us who have been privileged to serve as missionaries of His Church!